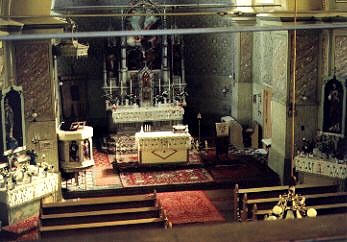 In October of 1989, Duncan Gardiner, a professional researcher, visited Nitzkidorf to seek information on the Dassinger, Seffernick, and Augustine families for Dorothy Acton. At the time of this visit, Roman was under the Ceausescu regime. Two months later, the dictator fell. © Nitschkidorf Report and Photos 1989 Duncan B. Gardiner, Ph.D., C.G. © 1989 Duncan B. Gardiner, Ph.D., C.G. 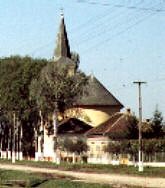 ; Permission granted to DVHH.org to republish his report on Nitschkidorf, Rumania. 1. 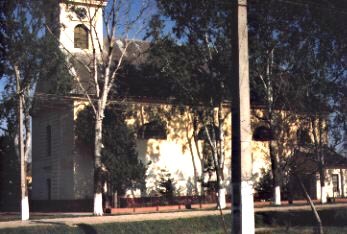 On Friday, 13 October 1989 I visited the Bishopric; Str. Matei Corvin Nr.2) in Timisoara, Rumania and spoke with Dr. Ferdinand Cziza. He told me that the Nitschkidorf parish records are held in the Timisoara Archives (Bodnaras Str 8, Timisoara). I had previously heard in Vrsac, Yugoslavia, that the Roman Catholic bishop's duplicate parish records for the entire Banat may also be there. While at the Bishopric, I also spoke with Sebantian Krauter who appears to be the appointed bishop of the region. It appears he could not use the title officially in Rumania because of government policy. Sebastian Krauter was born and raised in Nitschkidorf and gave me the name of a contact in the town. I travelled to Nitschkidorf later that day. It is only some 20 miles from Timisoara, but the road is not paved. The last five miles is so rutted and uneven that maximum speed was ten miles an hour. Mr. Graszl turned out to be a retired tailor who was choirmaster of the Roman Catholic Church. He speaks excellent German, his native language. 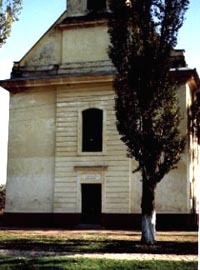 Up until five years ago, the congregation was large enough to have a choir, but Nitschkidorf is now mostly Rumanian non-Catholic. 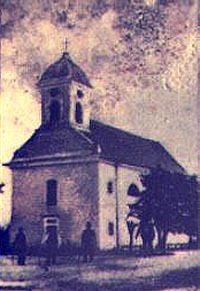 Mr. Graszl was nice enough to open the church for me and allow me to take the photographs which are enclosed with this report. He also played the organ for me. In the cemetery I noted no grave markers older than the 1890's. There were quite a few graves; enough to make a thorough search impossible before the end of the day. 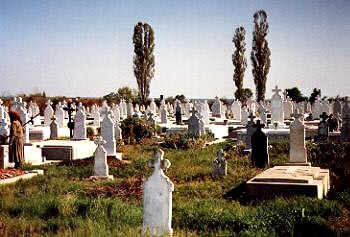 All the markers are dazzling white stone; there was half a dozen ladies scrubbing headstones with soap and brush. 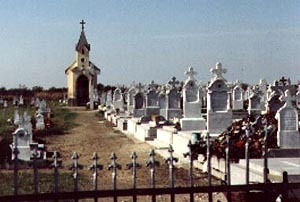 Most of the graves were tended immaculately. I asked about Dassinger family graves and was directed to Wendel Dassinger's, photo enclosed. 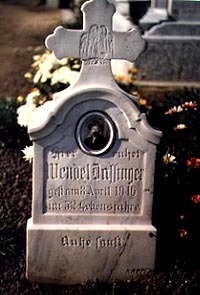 It reads: Here rests Wendel Dassinger, died 8 April 1916 in his 52nd year. Rest in peace." So he was born in 1864 or 1863. I noted no other Dassinger graves. There appeared to be several Augustin head markers, but none I could connect with data you gave me and none from before 1900. We returned to his house where he showed me a kind of register of all the German families living in the village. He had two Dassinger family addresses, for Franz Dassinger and Georg Dassinger. I asked him about Sefernick and Augustin families, but there do not appear to be any living in Nitschkidorf now. On the way to the cemetery I chatted with two older ladies and asked about Dassinger families. One of them knew of a Wendel Dassinger who emigrated to Canada, sometime after World War II it seemed, had two sons there, one of whom had died. She had no idea what city or where an address could be obtained. As I was leaving town, a middle-aged man asked for a ride to Timisoara. He had a number of packages, including a large bottle of young white wine, which we loaded into the trunk. On the way we had an interesting conversation in which he said that in order to join his relatives in Germany he and his wife would have to pay an inordinate sum of money for an exit visa, something like ten thousand dollars if I recall. He said: "Yes, we're just in one large prison here." I hope things are easier for him now. When we unloaded the trunk in Timisoara we found the wine bottle had overturned and spilled fermenting wine onto the trunk carpeting. The smell of that wine in the hot sun as I drove to Bucuresti and back, for a whole week, reminded me of Nitschkidorf. That poor Opel Cadett went through a lot: a rutted road which threatened to break its axles, a baptism in wine, and four hubcaps stolen someplace in Rumania, discovered only on my return to Munich. Before going to Nitschkidorf I had sought out the Archive on Bodnaras Street: No street sign, no number on the building. The man at the door would let me enter no further than the small vestibule and said I would have to get permission from the main archive administration in Bucuresti to study there. This I had expected and drove to Bucuresti the next day, stopping the first night in a small mountain town just south of Brasov. Rumania turned out to be larger than I had thought. One cannot drive that fast because of the horse-drawn wagons, sheep, bicycle riders, and cows on the road. One sees an occasional fox in the headlights. In Bucuresti I first visited the American Embassy to chat with the Cultural Attache. In her office was an American professor of history who has a Fulbright grant to do research. He had been there a month and had not yet gotten permission to use the archives. The Cultural Attache had no great words of wisdom for me. The following day I visited the central archive office, not very far from the Hotel Intercontinental, and submitted my requests for information in writing. The lady there spoke good French and informed me that it usually takes three to four months to get permission to use the archives. I asked whether the records I had requested could be sent to me. She said there was some possibility, but, now that I think back on it, I will not hold my breath. I do intend to follow up with a letter requesting that the records be sent and will form you of any results. I left the country with the feeling that despite some very nice scenery and some friendly people, I really did not want to go back. They may be able to deal with English, but you might have better luck writing in French. In Stuttgart, two weeks before going to Rumania, I visited the Haus der Donauschwaben and obtained two interesting reference books. The first is Donauschwabisches Ortsnamenbuch by Isabella Regenyi and Anton Scherer, published in 1980. The second is a spiral-bound listing of all the church registers which were microfilmed before 1945 in the Banat. It is called Die Banater Kirchenbucher, compiled by Josef Schmidt and published in 1979. Both are available from Haus der Donauschwaben, Goldmuhlestrafse 30, 7032 Sindelfingen, West Germany. 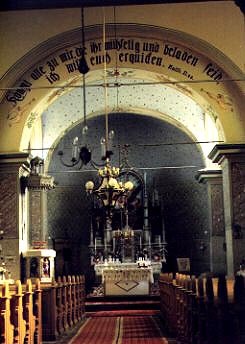 Another useful reference is a set of four mimeographed pages entitled Die Kirchenbucher der Banater Gemeinden in den Staatsarchiven von Temeswar und Arad (Rumanien), that is, Church books of Banat parishes in the Timisoara and Arad state archives, available from the same source. © 1989 Duncan B. Gardiner, Ph.D., C.G. ; Permission granted to DVHH.org to republish.